I remember back in the day, putting baby oil on so I could tan, dabbing my acne with Oxy pads and rubbing alcohol to dry it out, using Neutrogena as a cleanser and Nivea for a moisturizer. Wow, I was a hot mess! My skin never felt nice with all that stuff I was doing. It wasn’t until years later that I realized that simple is better; a natural bar of soap and facial oil-not a lotion or cream- is what my faced longed for. Creams contain some oil, but not nearly enough to make a big difference. Oils are lipophilic (meaning they pass through the lipid layer of the skin) preventing water loss and plumping skin with moisture more effectively. So, forget about the oil-free hullabaloo-your skin welcomes natural oils! Not all oils are the same, however, dry skin needs oil that will hydrate and oilier skin needs a lighter consistency. There is an oil for every skin type. It may take a bit to understand them, but once you do you will surely enjoy the benefits of glowing skin and the savings in your pocketbook. See what the Huffington Post has to say about this new facial oil craze. 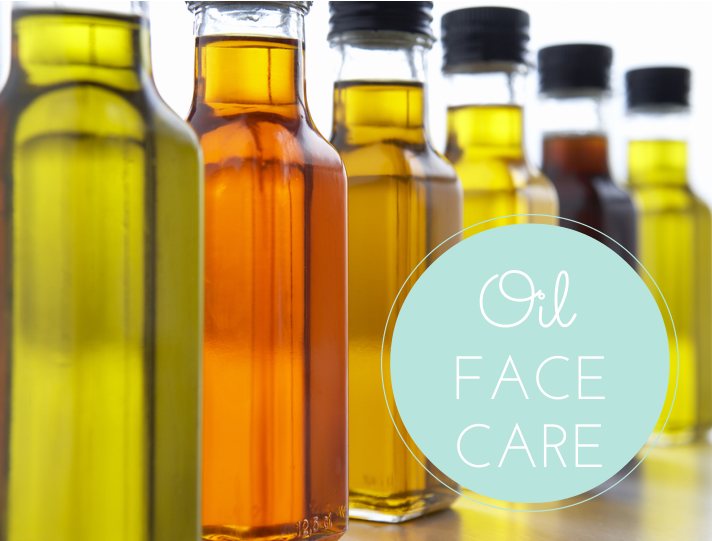 Oily skin: Grape seed oil with Tea tree, Cypress and Bergamot essential oil. Aging skin: Argan, Carrot seed, Borage, or Rosehip oil with a drop of Vitamin E and Geranium, Ylang Ylang or Patchouli essential oil. Dry skin: Olive oil with Clary Sage or Lavender essential oil. Acne prone: Grapeseed or Safflower oil with Cedarwood, Lemon, Peppermint, Tea tree or Thyme essential oil. Sensitive skin: Sweet Almond or Jojoba oil with Jasmine, Lavender or Geranium essential oil. Use a light coconut oil for protection against wind and cold. Improve and soothe your face with a dab, gently pat your skin, there is no need to rub, it will absorb naturally. If you want to learn more about the science behind which oil works best for your skin type in an easy to understand way-check out this post by Dawn Michelle of MinimalistBeauty.com.